Big Old Coin Necklace, Silver Coin Necklace, Half Dollar Necklace, Custom Coin Necklace, Peace Dollar Necklace, Liberty Necklace, History Necklace. Silver dollar, two eras of half dollars and quarters. Hand made sterling silver links with your choice of bead and crystal rondells. This coin jewelry necklace can be made with your coins for $200. 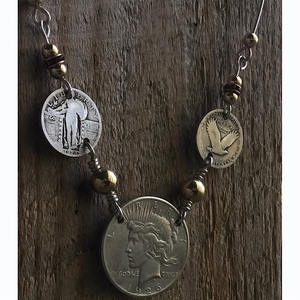 This handcrafted coin jewelry necklace is made in the USA.